Dental implants are used to replace a single missing tooth or several of them; and can also be used to support a removable prosthetic that replaces all of a patient’s missing teeth. 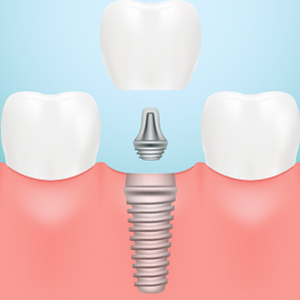 A dental implant is a tiny titanium/zirconium post integrated into the bone that serves as a secure and permanent “artificial tooth root.” Attached to the post could be a dental crown, dental bridge or denture. The procedure for receiving a dental implant takes place over several months and requires a team of dental experts, directed by your dentist. Your dentist will perform a comprehensive evaluation to determine if you are a candidate for dental implants. Next, using 2-D and 3-D imaging, a plan will be developed to determine exactly where the dental implant will be placed, as well as the size, shape and details of the restoration (dental crown, dental bridge or denture). A dental lab will fabricate the restoration. One of our periodontist partners will place the implant which then takes about 3 – 6 months to heal and integrate with the bone. Once the dental implant has healed, your dentist will adjust the fit and seat of your restoration, as well as the color and stain to ensure natural-looking, comfortable results.